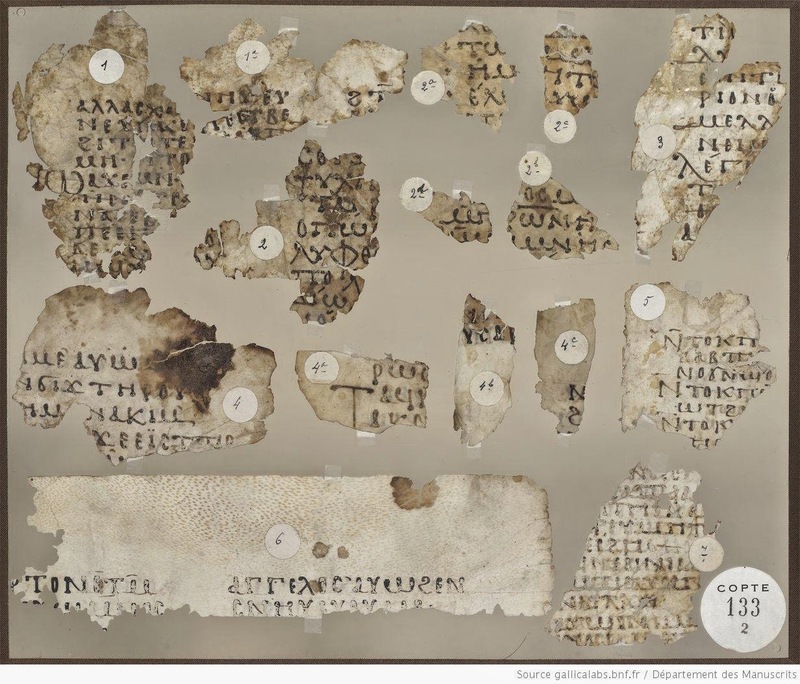 Evangelical Textual Criticism: The Date of Majuscule 0305 - Suggestions? Currently the Liste gives a wonderfully ironic date for majuscule 0305 (Matthew 20) of -100 to -1 (here). The total absence of any discussion piqued my interest, and, thanks to the resources of the BnF I found an online image! The whole frame with multiple fragments contains mainly Coptic stuff, hence its listing under Copt. 133.2. 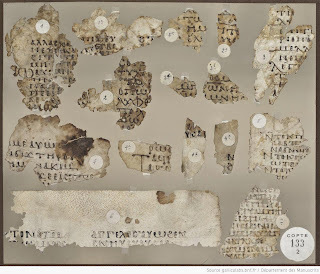 Our fragment is number 3 at the top right, showing the left hand margin of Mt 20:22-23. Note that the total column width is only about 8 letters. I am not very good at dating this particular script, but I will kick off by stating that on first sight I would be happy with anything between the 6th and the 9th century, and more likely younger than older. So let’s do a little online, democratic, scholarship here. Suggestions? Parallels? Surely we can get closer than somewhere in the first century BC. Looks quite close to 0177, which is 10th CE. In the published Liste (1994 2nd) it is the only majuscule manuscript without an assigned date - the column is empty. I looked at a few of the mss I have on file. It looked closest to a 9th century ms (Ra 740), not an eighth (Ra 612) or tenth century manuscript (Ra 788). The lambda is so elegant and the theta is closed. The mu is cursive. I would guess 9th-10th century. This is a White Monastery fragment, and IMO all fragments from this find should be dated to the X-XI centuries, with the possibility of the the first decades of the XII. This range derives from the colophons extant in the fragmentary collection of approximately 300 manuscripts. Check this article by Tito Orlandi, here. 0305 doesn't include the additional clause found in Matt 20:22 by the Majority Text. True... but line 6 (recto) is curious because it begins with νειν̣... and what would seem to be the next word (λεγουσιν) starts on line 7. So it's mysterious as to what concluded line 6. Was it just blank?... or was there some otherwise unknown short (3-6 letters) variant reading? The lines on recto have 7-10 letters each. Certainly, the long reading about baptism in Byz maj wouldn't fit. On the verso (which is more sketchy), it looks like κ(υρι)ε immediately follows παραγει εκραξαν λεγοντες... with κ(υρι)ε immediately before ελεησον ημας... as in B/03 (IV cent), L/019 (VIII), Z/035 (VI), 085 (VI), 0281 (VII/VIII), inter alios. This hand, Alexandrian Majuscule, changes little over time and is therefore hard to date. There is little to choose between this example and P. Heid. IV 295 or P.Berol. 10677 (Cavallo and Mahler, Greek Bookhands, 300-800 AD, p. 114), both Paschal Letters dating the beginning of the 8th century (the latter is 713 or 719).